So you have Rock Band, Rock Band 2, Guitar Hero World Tour, and Lips. With each new game bundle you get a separate microphone, and all of these are now laying about taking up space. Well it is time to celebrate, your problems are coming to an end. Go forth and break free from the cords. Microsoft recently announced that the newly released Guitar Hero: Metallica and Rock Band 2 will be among the first music titles to support the Lips wireless microphones. 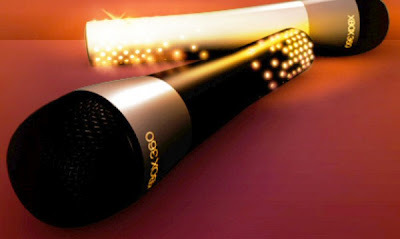 Lips microphones are equipped with motion-sensing technology and built-in LED lights that flash along with your performance. Microphone compatibility will first appear with support for Guitar Hero Metallica. A title update this summer will also activate microphone compatibility with Rock Band 2. Expect additional titles supporting the Lips microphones later this year, only on Xbox 360.